2 (a). Consequent upon implementation of 7th Pay Commission Orders, Lt Generals (HAG) promoted after 01/01/2016 are drawing more pay than the Lt Generals (HAG), in same Corps, promoted before 01/01/2016. The case are under examination for stepping up of pay of Lt Generals (HAG) promoted before 01/01/2016, at par with pay from the date of promotion of Lt Generals (HAG), in that Corps, promoted after 01/01/2016. 2 (b)(i) Pay revision in Approx 31 such cases is under progress and will be found adjusted in 09/2017 Pay Account. 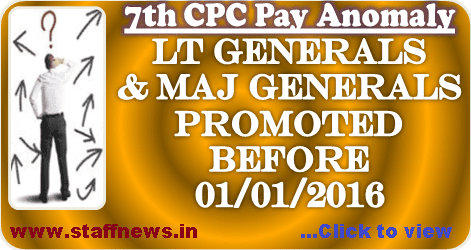 Consequent upon implementation of 7th Pay Commission Orders, Maj Generals promoted after 01/01/2016 are drawing more pay than the officers in the same Corps, who were promoted as Maj Generals prior to 01/01/2016.